Given the history of the project, the gubernatorially-controlled Empire State Development will approve whatever the developer--now Greenland Forest City Partners--wants. 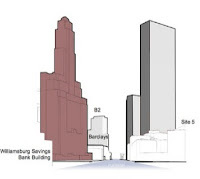 But in this case it will have to confront not only questions of why the City Planning Commission in 2006 recommended that the Site 5 tower be reduced (to 250 feet), but also whether an "office tower" with "jobs" is also a condo tower with 188,000 square feet of high-end retail. Earlier in the interview, Gross asks Gilmartin about Pacific Park Brooklyn. "It's a great question," Gilmartin replies amiable, "because if the project is anything at all, it's a series of partnerships. We have partnerships with the city, we have partnerships with the state. I would say every agency in New York City government has touched this project. We have since sold the team and the arena to the company Onexim, which is run by Mikhail Prokhorov." "And, as we looked at the timeline for building all the residential, we realized, with all the equity we put into the project, and the need for speed and the desire to build, we would be wise to bring a partner in," she says, not quite pointing out that they needed to reduce risk and were willing to take a loss. "And we set out to find a partner, a well-capitalized partner." "We're talking about an equity investment that could approach $800 million by the time the project is brought into fruition," she says. "That's not an easy check to write, and to explain the project to an investor is another really complicated matter." "So we knew we needed to deal with a very sophisticated outfit that really understood our business. And in Greenland, we found that," she continues. "This is a $50 billion Chinese developer... they do it at a scale that could be viewed as small, compared to the things that they undertake. And I have to say that we have had enormous success with Greenland. We have a cultural experiment folding on the 18th floor here. We have over 25 Chinese nationals working side by side." For now it's a partnership with "enormous success," but that partnership itself has decided to try to sell stakes in three building sites, B12, B13, and B3, which suggests Greenland doesn't want to write the check any more. And Forest City does have a track record of conflict with some partners, notably Skanska on the modular building and Blumenfeld Development Group on the Nassau Coliseum. Shortly after I annotated the map below last October, Forest City's parent company announced unspecified delays in the project. When asked about the Barclays Center and the Nets, Gilmartin talked about having to sell the team and arena (operating company), acknowledging, "It's a perfect example of how you can't get too emotional about real estate. Because selling the arena was the right thing to do." "Tell us a little about what you'd like to see change in the borough," Gross asks. "Brooklyn's arrived in so many ways, residentially speaking. We have a sports arena," Gilmartin replies. 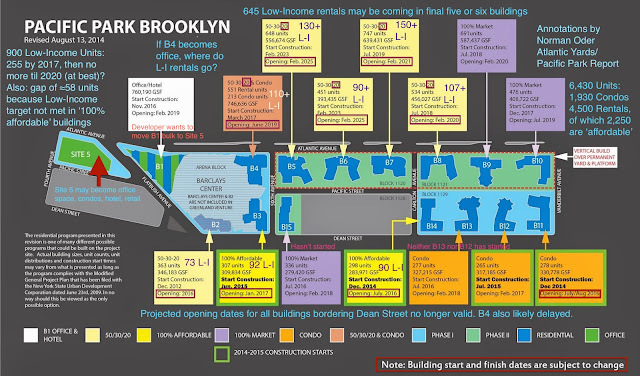 "The notion of Brooklyn having a Class A, 21st-century iconic office building--that hasn't quite happened yet. And so you have buildings like Watchtower, you have converted warehouses down in DUMBO, but you do not have a building that would be Brooklyn's own version of Time Warner Center." "And I would say that, on my watch, if you said to me what would make you most proud if you think about life after New York Times Building, New York by Gehry, Barclays Center," she says, "I would say that being able to build an iconic office building, at Site 5, which is where Modell's and P.C. Richard's sit today, it's an unbelievable site, it has view corridors all the way to the Manhattan Bridge, up Flatbush Avenue." "It has the gravitas to hold a million-square foot building, and the sister building would be the Barclays Center. So my dream for that corner of Brooklyn would be to deliver to Brooklyn a Class A icon in the commercial space." Deliver to Brooklyn? Gilmartin is conflating location and benefit. Yes, the building would be placed in Brooklyn. But Greenland Forest City Partners, which does not want the logistical and financial headaches of building the tower as approved at the prow of the arena--and likely agreed with new arena operating company owner Mikhail Prokhorov that no such tower would be built--is not building for Brooklyn. It's building for its investors. I never heard anynone refer to Time Warner Center as Iconic. Its also not an office tower. Whats she thinking? Well, it's partly an office tower. I've updated my article. But keep watch on the use of office space (jobs!) to leverage the change to a mixed use tower at Site 5.